Cylindrical storage tanks are generally of atmospheric model, they are usually made for storage of the pressure liquid. 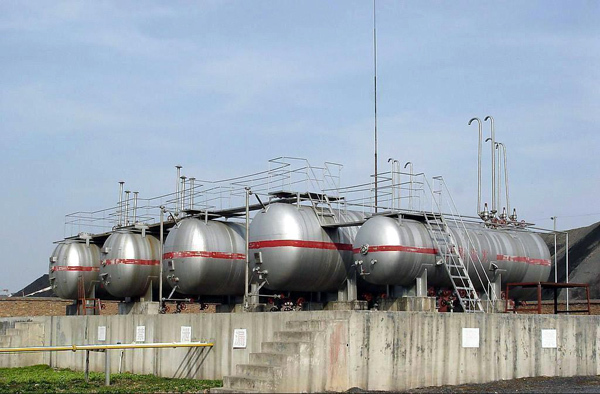 And spherical tanks are generally high pressure storage tank. For LPG storage tank, it has the feature of high boiling point, with room temperature and pressure condition is about 2 mpag, LPG is at liquid state. So pressure spherical tank can be increased to 2 mpa, it does not need to be installed with cooling system and other facilities, LPG can be stored directly and there won't be volatile. If stored for atmospheric pressure (1 ATM, for example), the boiling point on - 30 ~ 40 ℃. Environmental thermal heating would speed the gasification progress, high temperature gas produced must be cooled down with proper treatment, otherwise the gas will escape, on the whole LPG storage need lower temperature, higher temperature would lead to LPG leakage, so it is necessary to choose a well functioned cooler system.